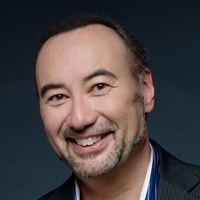 Known for his passionate artistry and engaging stage presence, pianist Jon Kimura Parker has performed as guest soloist with the Philadelphia Orchestra and Wolfgang Sawallisch in Carnegie Hall, toured Europe with the Royal Philharmonic Orchestra and André Previn, and shared the stage with Jessye Norman at Berlin’s Philharmonie. Conductors he has recently worked with include Teddy Abrams, Pablo Heras-Cassado, Claus Peter Flor, Hans Graf, Matthew Halls, Jeffrey Kahane, Peter Oundjian, Larry Rachleff, Bramwell Tovey, Xu Zhong, and Pinchas Zukerman. A true Canadian ambassador of music, Mr. Parker has given command performances for Queen Elizabeth II, the U.S. Supreme Court, and the Prime Ministers of Canada and Japan. He is an Officer of The Order of Canada, his country’s highest civilian honor. A member of the outreach project Piano Plus, Mr. Parker toured remote areas, including the Canadian Arctic, performing classical music and rock’n’roll on everything from upright pianos to electronic keyboards. In commemoration of his special performances in war-torn Sarajevo in 1995, he was a featured speaker alongside humanitarians Elie Wiesel and Paul Rusesabagina at the 50th anniversary of the relief organization AmeriCares. An unusually versatile artist, Mr. Parker has also jammed with Audra McDonald, Bobby McFerrin, and Doc Severinsen, and this season performed tangos on two pianos with Pablo Ziegler. Mr. Parker also tours his new project Off the Score in a quintet with legendary Police drummer Stewart Copeland, featuring both original compositions and fresh takes on the music of Ravel, Prokofiev, and Stravinsky. An active media personality, Mr. Parker hosted the television Series Whole Notes on Bravo and CBC Radio’s Up and Coming. His You Tube channel showcases the Concerto Chat video series with illuminating discussions of the piano concerto repertoire. This season Mr. Parker performs as concerto soloist with the Ann Arbor, Colorado, National, Pittsburgh, San Diego, Toronto, and Vancouver symphony orchestras, as well as the National Arts Centre Orchestra in Ottawa and the Los Angeles Chamber Orchestra. He gives recitals with Cho-Liang Lin and throughout the season gives concerts with the Montrose Trio. A committed educator, Jon Kimura Parker is professor of piano at the Shepherd School of Music at Rice University. His students have won international piano competitions, performed with major orchestras across the U.S., and given recitals in Amsterdam, Beijing, New York, and Moscow. He has lectured at the Juilliard School, Colburn, Steans Institute, New York University, and Yale University. Mr. Parker is also artistic advisor of the Orcas Island Chamber Music Festival, where he has given world premieres of new works by Peter Schickele and Jake Heggie. Parker studied with Edward Parker and Keiko Parker privately, Lee Kum-Sing at the Vancouver Academy of Music and the University of British Columbia, Robin Wood at the Victoria Conservatory, Marek Jablonski at the Banff Centre, and Adele Marcus at the Juilliard School. He won the Gold medal at the 1984 Leeds International Piano Competition. He lives in Houston with his wife, violinist Aloysia Friedmann, and their daughter Sophie.